Cattle owners cannot be seen withholding their hands, to leave the cattle on road surviving on water of drains/sewer and garbage which is definitely a cruelty, the court said. In a bail application moved by persons accused of slaughtering cow, which is a crime punishable with 7 years imprisonment in Uttar Pradesh, the Allahabad High Court, apart from granting bail to the accused, has issued directions to the Government authorities and the cattle owners to ensure that no cows or animals come on road creating obstruction to traffic and threat to life. The bail applicants had contended that whenever any meat is recovered, it is normally shown as cow meat (beef) without getting it examined or analyzed by the Forensic Laboratory. The state opposed the bail application contending that cow slaughtering leads to acrimony between various groups of society and has also resulted into riot like situations which poses serious problem for law and order. During the course of arguments, it was also argued that many cows are on roads or on fields their abandonment stands to adversely affect the society in a big way. It was also pointed out that old or infirm cows become liability as it has become difficult for owners to afford the fodder for them, that is why either cattle is left unattended, abandoned or sold for petty amount, willingly or knowingly sending them to slaughter houses, as Goshalas are reluctant to take such cows quoting scarcity of fund/space. Some way out has to be found out to keep them either in the cow shelters or with the owners; if Cow slaughter Act is to be implemented in letter and spirit, the court said. Justice Sudhir Kumar Saxena said that the argument that old, ill, infirm or non-milching cows can be slaughtered, does not appear to be correct and the protection of cow/progeny is needed in the interest of Nation's economy. The court said that only if adequate alternative and additional arrangements are made for taking care of unattended/abandoned cows, bulls and bullocks, purpose of the Act can be achieved. 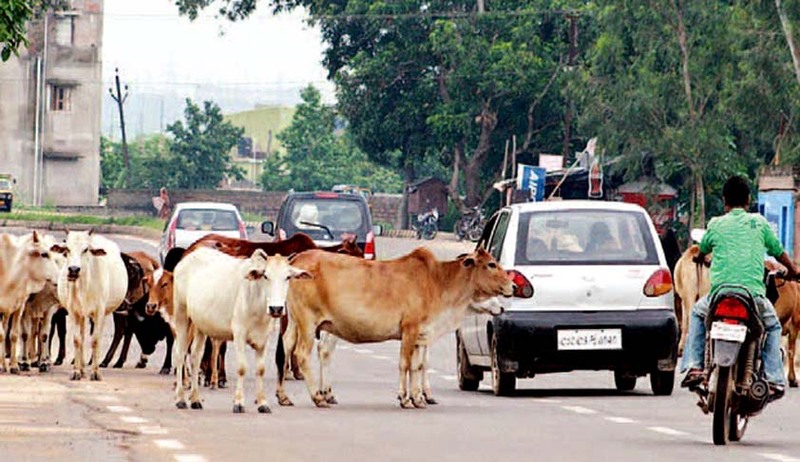 The court issued following directions to ensure cows are kept away from roads, saying that State Government has a duty to make arrangements like setting up Goshalas/cow shelters in adequate number so as to prevent the cows from reaching out on roads, fields and destroying crops apart from obstructing traffic. If animals are spotted on city roads and not removed quickly, proper action may be contemplated. Cattle owners cannot be seen withholding their hands, to leave the cattle on road surviving on water of drains/sewer and garbage which is definitely a cruelty. As such, owners of such animals should be prosecuted under the provisions of The Prevention of Cruelty to Animals Act, 1960, Police Act and Sections 289, 428, 429 I.P.C. as well. This will deter cattle owner from frequently leaving animals free on roads, putting their as well as citizens' life in danger.